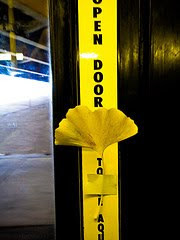 Yellow Ginkgo leaf on CTA bus door in Chicago, IL, by Matt Maldre (spudart) on Flickr.com. "I had my eyes on the bus doors with their yellow vertical strip. With my camera ready and tape on my Ginkgo leaf. The bus was rather full, so I wanted to make sure I was able to get up by the doors to place the Ginkgo leaf and take my photos. I got up just after the stop before mine, stood by the door, placed the leaf on the door and snapped several shots.Then I felt kinda like a dope standing there while everyone else stood there. But it's kinda neat to have the leaf there. I'm not sure how long it will stay up there." You can see more photos of his collection here. * Added photo of Ginkgo espalier. * New photo photospecial page: Oldest Ginkgo biloba tree outside Asia grows in Utrecht (+ video). * New topic: Rare Permian Ginkgo fossils shed light on seed development. Probably the oldest Ginkgo biloba tree outside Asia grows in the botanical garden 'De Oude Hortus' of the University Museum in Utrecht (the Netherlands). It is c. 260 years old (1730-1750), male with grafted female branch (c. 1830). This video can be watched in HD-quality. I made this recording on November 8, 2010. * Added video of oldest Ginkgo outside Asia (c. 260 years old, in Utrecht) on YouTube and on my page about the oldest Ginkgo trees in Europe and on my Tree-page. * Update of my page about the oldest Ginkgo trees in Europe. * Added new video on my YouTube channel and on my Propagation-page: Cleaning of Ginkgo seeds. Cleaning freshly picked Ginkgo biloba seeds. I made this video on November 7, 2010. Watch this video in HD quality. 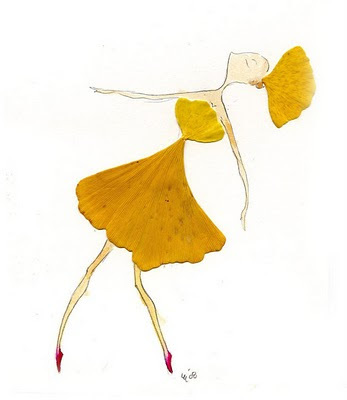 Lovely illustration with Ginkgo leaves made by Charrow.